My freshly minted college degree includes a concentration in urban studies. While I have no plans at the moment to become an urban planner, I’ve always felt that many of urban studies’ core ideas — about the ways we live and the demographic groups that define us — were deeply relevant for the 21st century and are applicable to just about every industry and every part of our country. I found that it encompassed many of the things I’d been writing about for years, the changes in how we live and work. In my personal life, I’d been doing a lot of things we’d discussed in class. I have never owned a car and, perhaps more shockingly, have never held a license to drive. I’ve walked or taken public transportation for most of my life, and I always lived in the core of a city, so I could have an existence that allowed for walking and mass transit. Three years ago, my partner and I bought a home in the middle of a neighborhood close to Chicago’s Loop. Our neighborhood (the West Loop) has growing density, a great walkability score, access to multiple channels of mass transit, two parks within a few blocks, and more restaurants and nightclubs than I can count. There’s only one thing: I’m really unhappy living here. Some of the things that I’ve always endorsed? Are driving me crazy. I am the worst urban studies student EVER. The biggest negative impact for me has been noise pollution. While we live in a nice building, literally every flat space surrounding us has been under construction for three years. THREE. YEARS. That’s three years of not being able to sleep past 6 a.m., of constant drilling and hammering and bulldozers and cranes. A new company has moved into a neighboring commercial building (formerly part of Harpo Studios), and promptly installed a motion alarm on their parking gate that I am pretty sure can be heard in Aurora. Possibly in space. Indeed, our neighborhood is BOOMING. Google’s Chicago headquarters are moving just a few blocks north. A hotel is opening just east of us, and many of the small, nondescript factory spaces dotting the West Loop are being snapped up by developers. A company called Sterling Bay has, to a large degree, bought the West Loop and is now developing its use. Of course, beyond the noise, which feels as if it will never end, many of the issues that are emerging show the wisdom of good urban planning and the repercussions that happen when it’s absent. It’s nearly impossible to cross Madison Street now with the boom in traffic, and lack of pedestrian crosswalks near us. Parking in the city is its own nightmare (Google Chicago parking meter deal) but I’ve never understood why parking doesn’t come *before* or *as part of* planning here. There’s a huge, hulking half-built building at the west end of the West Loop that would be perfect to retrofit into a neighborhood park house, with shuttles running up and down Randolph. 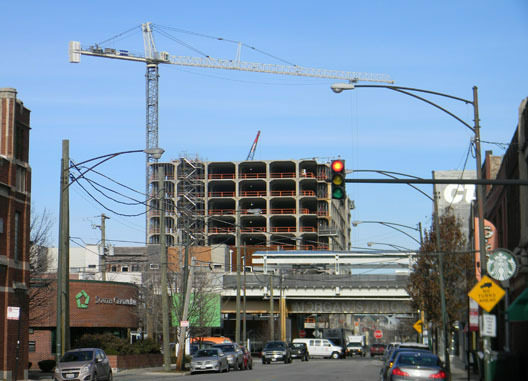 Residential development has been the main part of the boom thus far, but as commercial development continues, a conflict is emerging between the two camps. I haven’t seen any movement to define patches of the West Loop as solely residential or commercial. We’ll have two rooftop bars opening soon near us – far closer to residences than they should be. The other main irritant hits a little closer to home. In my mind, I always thought that living in close quarters with your neighbors would lead to that kind of engaged community, where neighbors became friends, where people socialized and looked after one another. A few homeowner’s association meetings have disabused me of that notion. There’s still much to be said for sustainable urban living, and I haven’t changed my stance on those ideas, those policies. I think it might just be that we’re outgrowing this place. This neighborhood is becoming a huge cluster for clubs and nightlife, and will be a fast-paced hub for twentysomethings. My twenties are a bit in the rearview mirror for me, though. My partner and I want something quieter and calmer for our next home, and will likely move out of Chicago to find it. But I think we’ll be sticking with urban settings, or the “cosmoburb,” where access to walking paths, bike paths and mass transit still exist. Of course, I also know that I’m ridiculously lucky. Lucky to have a home, lucky to have a choice to leave a place that isn’t a good match. We’re in Chicago, where bad planning and years of discriminatory zoning and lending policies have created neighborhoods where basic life, liberty and safety are harrowingly hard to come by. Lots of people don’t have the choices we do to change neighborhoods, or to move at all. Rahm Emanuel has followed in the footsteps of the Daleys, enacting or sustaining policies that stand in the way of evolution or change for disadvantaged neighborhoods. 2014 feels a lot like 1974 in some of these neighborhoods. It feels impossible to effect change here. Hopefully, our next home will be in a place where we can take advantage of good planning and great living space — but also contribute to our community, where we can become advocates for everyone who lives there. I’m going to brainstorm about this right now! You might not be able to hear me, though, with the noise in the background…….